Elevation profile created by Zdenek on his 2014 GDT hike Thank you for allowing me to share these Zdenek! Last few miles are not included because we started an alternate off the GDT. I managed to stay warm last night wearing most my layers, but I woke up at 4:30am having to pee and refused to move. I just laid there too uncomfortable to sleep, but determined to stay warm and dry as long as I could. E yelled over to me at 5:45am to make sure I was awake. I could hear it drizzling on my tent and was waiting for the last possible moment to have to get back into the damp cold. We agreed that it wouldn’t do any good to wait and just started packing up. Thankfully, it did stop by the time we started hiking at 6:30am and the air wasn’t as cutting as yesterday. 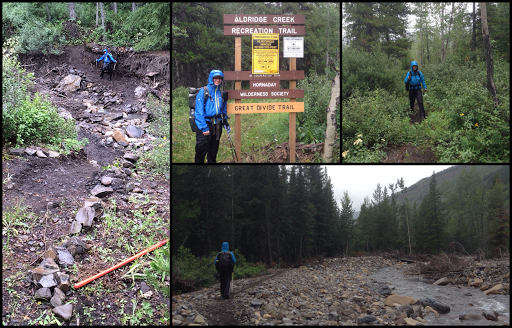 We headed through the clear cut and on up to Fording River Pass. 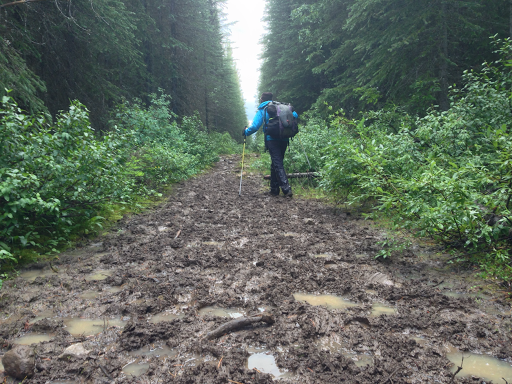 The last 59mi/95km we’ve hiked through is said to be the one section that has been blazed and maintained by the GDTA. 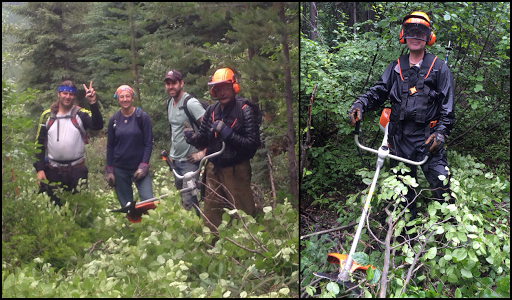 It’s been wonderful and we are going to miss having those orange blazes and maintained trail! We even got to our first (and possibly only!) 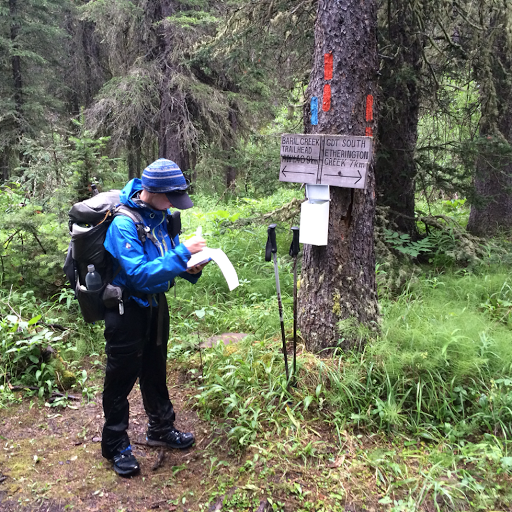 trail register specifically for GDTers. The group that maintains the section we were in left a register for people to sign. I also think this might be the the first time we’ve seen a GDT sign like that at an intersection. Pretty cool! 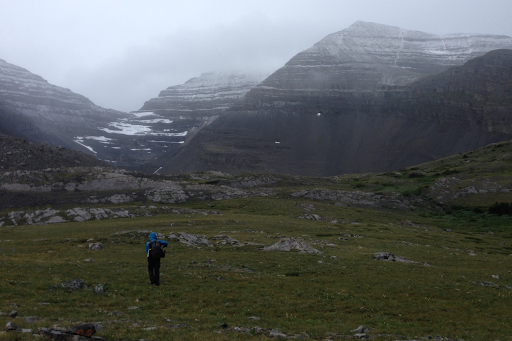 As we climbed up toward Fording River Pass, the light drizzle started that pretty much fell most of the day from overcast skies. It wasn’t bad compared to yesterday’s amount of precipitation and we both were more prepared with the warmer layers and accessories. I kept my rain gear, second layer shirt, buff, beanie, and gloves(when dry enough) on all day. I was still quite chilled just from yesterday and couldn’t shake it. When we got up to the pass, we apparently took the scenic route. We followed a horse trail rather than an old road bed thinking it might have been newer trail. We eventually got to the right spot, and as a bonus, we got a closer view of some nice mountains dusted with the recent snow. 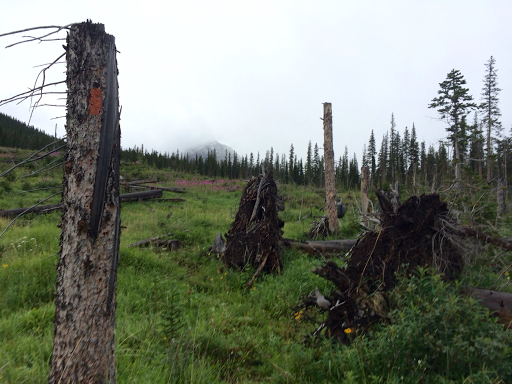 The next section of trail from Fording River Pass to Aldridge Creek, is notorious for having some of the worst overgrowth on the whole trail. We buffered in a lower mileage day knowing we’d have that bushwhack and then expected navigational challenges along the washed out Aldridge Creek. 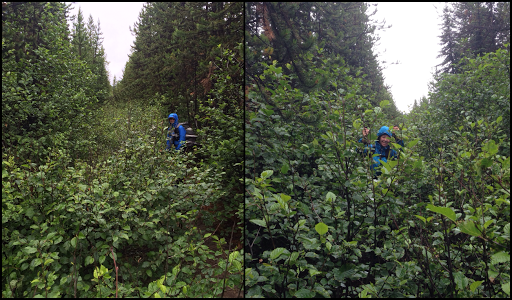 When we got to the overgrown section, it was alders over our heads that were covering a clear trail tread. They were fully saturated with water and we were immediately drenched going downhill through the alders. It was in the upper 40sF/8.9C and I was, once again chilled quite a bit despite the full rain gear. We decided to time how long it took to push through. It was a few kilometers/couple miles long, but going through it for 30secs felt like an eternity. We went for 20mins and heard something up ahead. Bare in mind that we hadn’t seen anyone in almost two days. What we heard was what sounded like a chainsaw. Normally, that would be an abrasive sound given our time in nature and having not seen anyone in awhile, but once we realized what was possibly happening, we celebrated…someone was clearing the brush! We rushed down as fast as we could. Since they were downhill from us, we hooted and celebrated when we were about 10yds above them and we could see swaying brush falling. We yelled and held our poles in the air and the motor stopped. We came on through to see the most amazing sight…a cleared trail! 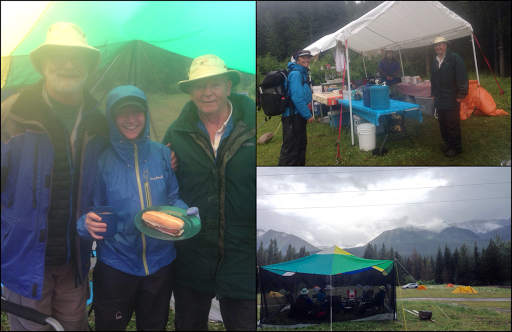 It was the Great Divide Trail Association! The history of the GDT is really interesting. A very abridged version is that it got going in the late 1970s when a small group of college students put together a survey after an initial proposal feel through years earlier. It’s had its growth spurts and quiet periods. There has been a strong resurgence in the last few years and the few and mighty of the GDTA have really taken the reins and done some amazing things! 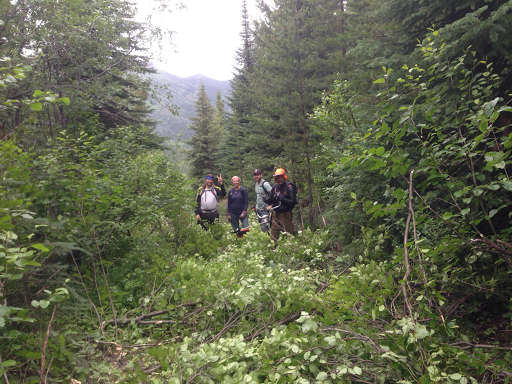 The most recent being that they are clearing some of the most notorious overgrown or washed out sections this summer! Here’s the awesome people we met! I know these details won’t mean much to all you readers, but it does to me and E since we got to talk to them and it was such a wonderful moment to meet the people making this trail happen. *Any of you that see this, please tell me if I get any details wrong. Here’s Jean-Francois, Kathy, Neil, Mark, and Rob. 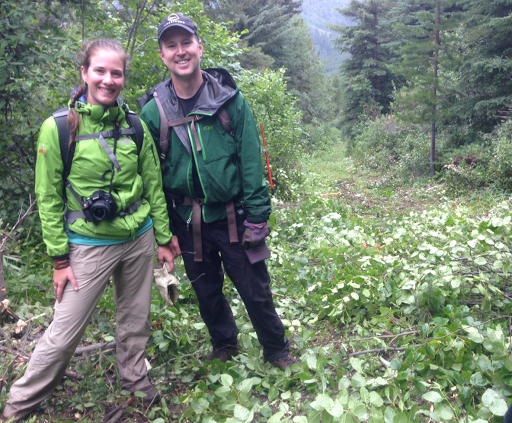 Here’s Brad(GDTA president) & Jocelyn(Media) who I’d been in touch with in the months before the trail. Just great to meet them in person! They will be doing the GDT next year, Brad’s 10yr anniversary of his first GDT hike. The crew will be hitting another overgrown stretch up north before we get to it and we joked that Brad and Jocelyn and getting all the rough spots cleared out just in time for their hike next year. We’re lucky and are glad we got to do a bit of that overgrowth before it got cleared. Makes us appreciate it all the more. Anyone wanting to donate to the efforts of these amazing GDTA volunteers, here’s the link. The group told us that their camp for the four days of work was set up along our afternoon road walk at Weary Creek. We decided it would be fun to have a late lunch there and aimed for that. Before the road walk, we hiked along Aldridge Creek, which had been washed out in 2013 (I think) and is known to have very difficult navigation. The magic of the day continued as the GDTA crew had just completed work on that section the day before. It was glorious! We were cruising and it was such a wonderful thing compared to the slog we were expecting for today. We hit the road, and had a couple hours of road walking to the late lunch at the GDTA basecamp. To make things even greater, I got service the whole way on the road and I got to be productive and get blog and correspondence stuff done. Wahoo! It was still raining (mostly misting), so I was able to keep the screen dry under the umbrella. The problem was keeping my fingers warm enough to type. 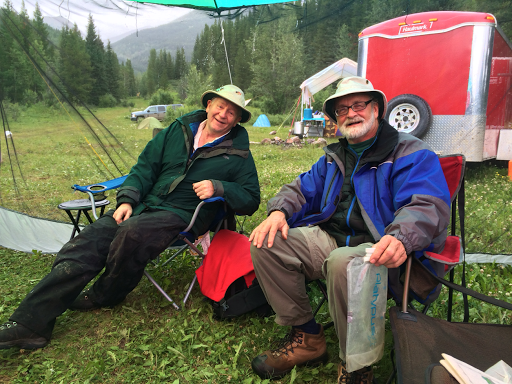 When we got to the basecamp, we met Wayne and Dan. These two were great to talk to! They gave us hot coco and we got to eat lunch under their protected screened in tent. Dan even made me a brat and they sent us off with a dehydrated meal too. THANK YOU Dan and Wayne! They have quite the history and connection with the GDT trail itself, and in 2005, were the two founding members of The Friends of the GDT. 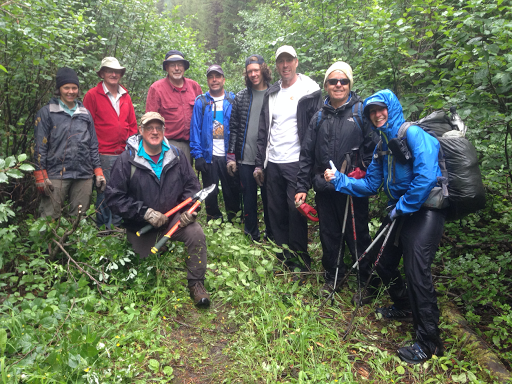 This is the group that took over in maintaining the trail when things with the GDTA went quiet in the 90s. It was basically Dan and Wayne and whoever else they could scrounge up. Now, Dan and Wayne are bursting with pride to see that the trail has hit this resurgence and they are able to pass the torch so to speak. It must be so amazing from their end to have such a relationship with this awesome trail and to see it evolve as much as it has. Needless to say, this day, and especially lunch with Dan and Wayne made a very mist-ical day a magical one! It really has given us a deeper connection and understanding of this trail to meet everyone so closely involved with preserving and maintaining it. On a side note, E and I noticed how matter of fact they all were about the damp and chilly weather. It was like it was a balmy summer day to them and I was chilled to the core all day. We figure they must be so used to it that it’s just normal. Funny. Despite Wayne’s offerings to drive us down the road, we stuck to our guns and walked another couple hours on the dirt road. Another bonus to seeing the crew today was that they told us the weather tomorrow would be great. We really needed to hear that because we were unsure of doing an alternate that should only be done in clear weather that we were wanting to do tomorrow. They also gave us enough information about the route that we were able to hike further today to set us up well for the Coral Pass alternate tomorrow. We are really hopeful and excited about this one. For those future GDTers wondering about the Coral Pass alt, there is a ford of the Elk River very early on when you fork off the original GDT route. It can definitely be a treacherous one in a normal to high water year. We think mainly horses do that crossing, but we were lucky it’s been a low water year and it was below our knees just a bit upstream. 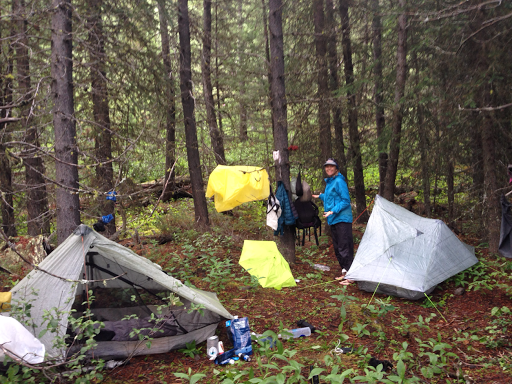 We then walked a cut line that was very muddy in parts and provided few opportunities to camp.